I’m taking time away from this blog because my schedule is not giving me enough time to write for it and because I feel like I’ve diverged from my original intentions of providing a nerdy perspective of action sports. I want to take the time to figure out exactly the kind of content to provide, which will probably mean less X Games recaps. This blog won’t be gone completely, but I don’t know when it’ll be back up. Thank you. This past Memorial Day weekend, my almost 11-year-old dream of being able to ride a motorcycle finally came true! I took lessons on how to ride a motorcycle through Motorcycle Safety Instruction. I highly recommend the course (even if two days does not suffice in getting me ready for the roads) because it allows me to bypass the riding exam at the DMV. I still have to take the written test, but they’ve given me all the info I need for that. The first day of class began with a bunch of videos and info on motorcycles and safety. They give you all the answers to the questions in the booklet. It probably would have been boring had I not forgotten everything I learned about motorcycles back in the day. Plus, there are things you can only comprehend after you’ve been on a bike, like how you have to press on the handlebar on the same side as the direction you’re turning, a.k.a. countersteering (think inertia… or read this). In the afternoon, we got to ride, and that was when I realized how strenuous the course would be. I also realized how out of my league I was on a 250 (it was a Suzuki GZ250). I felt too small while my brother felt too big for the bike. It was a frustrating day for me because I kept stalling the bike, couldn’t shift very well (my instructor had trouble with the lever too), and fell twice. Luckily I wasn’t moving when the bike fell, but it landed on my left foot and I couldn’t get up on my own. In addition to road rash and scrapes, I got a nasty bruise from the foot peg jabbing me. . No wonder they told everyone to wear long sleeves, jeans, and boots; they really do help! The top of my left foot also got a bruise from the lack of padding in my boots and the stubborn gear shift lever, and I had blisters on my feet. My injuries didn’t bother me as much as the blow to my pride and the heat. I felt so bad that I was ready to quit even though learning how to ride was my dream. I also considered going for a moped instead of an actual bike since they’re small and don’t require shifting. Luckily I remembered that to ride a motorcycle was a dream (and that these lessons were not free). Also, it would be easier for me to transition to a 50cc scooter than the other way around. I persisted even though I wasn’t sure I could survive another day. Somehow I did, and I did a lot better on day two. Meeting early in the morning made the class less exhausting, and I wore hiking boots instead of the black ones I wear everywhere. I was less shaky on the bike even if the lessons got trickier (I hate U-turns). I was convinced I was going to fail the skills test, but they passed me. What a relief! Motocross truly is one of the most physically demanding sports. – I was ready to collapse after half a day of riding, and it took me 4 days after the classes for my muscles to stop aching. It really helps if you have driven standard transmission before. They deduct points if you’re too slow during your exam. Mopeds go about 100 miles per gallon of gas. Motorcycles can get about half that although it depends on how fast you go and what kind of bike you have. Advil and adrenaline are your best friends when you’re injured and sore. Ice helps too. Even though you have to be physically fit, anybody can learn how to ride a motorcycle if he/she work hard enough. Even if it was tough and had me limping like a zombie (my arms and shoulders hurt as much as my legs) for a couple days, I enjoyed the experience. I learned how resilient and strong I really am. After I got over the initial challenge of shifting gears and rolling the throttle, I felt more at ease with being on a motorcycle than being in a car. You’re one with the vehicle and a lot freer. I’m ending this long-winded entry with two dream bikes. 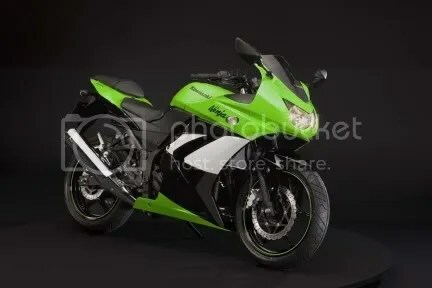 The first is actually one that I am considering because while it is a 250, it is one of the smaller bikes: the Kawasaki Ninja 250R. This was my first sport bike love. I spotted one in the parking lot of my high school and decided that I wanted a motorcycle like that if I ever hit the road. My love has not wavered, and unless it feels really weird when I sit on it (which is what happened with my brother), I don’t think I’ll ever stop loving the Ninja. 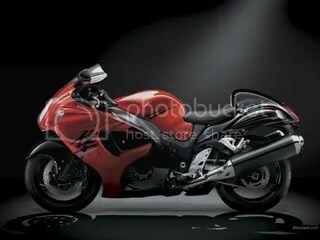 The other, the Suzuki Hayabusa, is completely a fantasy bike. I saw it in the Guggenheim Art of the Motorcycle exhibit in Las Vegas. It was the final bike in the chronologically-arranged exhibit and the fastest standard production motorcycle of the 20th century. Although I risk sounding corny, I saw the future in the bike. It reminded me of Kaneda’s bike in the anime, Akira. I don’t think I will ever be able to handle its great size or the 1300cc engine, but I can admire from afar. This is sort of a rehash of the page titled “Who is Motodork Jen?”, but here you can get to know me and this blog better. Whether you call them action sports or extreme sports (or even alternative sports), they are the last thing most people think a self-proclaimed nerd like me would be interested in. It’s hard to explain exactly what makes extreme sports so appealing to me. They’re exciting, and that’s the part my friends and family get, especially after I make them watch with me. The part they’re not so sure about is why I act as though the X Games is the Super Bowl (remember, I’m from Texas) and why I idolize these crazy individuals who risk their life for one trick. Even though I always say that it was the 1999 Summer X Games that started it all, the spark of interest goes back further. When I was maybe 9 or 10, I checked out a book on Rollerblading, an after school hobby of mine. There was a section on aggressive in-line skating. It talked about using a Coke can to practice your jumps, which is what I did (except I didn’t have a Coke can so I used a book). Then Disney made a movie on aggressive in-line skating called Brink! Yes, it was a cheesy, and I initially tuned in for the cute actors. However, something about the characters and their carpe diem attitude really appealed to me and made me want to learn more about the subculture behind extreme sports. That eventually led to the 1999 Summer X Games, where I found my heroes in Tony Hawk, Fabiola da Silva (who did stunts in Brink! ), and Travis Pastrana. They took risks, pushed themselves, never gave up, and just enjoyed life. Watching extreme sports and occasionally attempting to do tricks on my Rollerblades and bike provided a break from the routine that, while I was normally okay with, made life boring. Freestyle motocross became my favorite sport because it was the opposite of what I was familiar with (and because the riders go bigger than all the other athletes). Extreme sports also gave me a sense of identity. It was the first interest that I developed on my own, and my love of the X Games became somewhat of a defining characteristic in high school. It made me interesting and unique. It gave me a place to belong, as I chatted with fellow freestyle motocross fans on message boards. This is why I have hung on so long even when my focus shifted to other interests. Even though it’s been years since I’ve stepped on a skateboard or tried to jump my bike off a homemade ramp, I still love extreme sports. I want to reconnect with the community, which I dearly missed when I grew too busy to post messages and follow the latest news. Maybe I am an outsider, but I want to showcase a different perspective of a world that is usually connected to punk rock, rebellion, and young men with lots of free time. I may be a small Asian girl who knows more about science and Japanese culture, but I’ve been following action sports for over 10 years now so that ought to count for something. Or at least make a few good “Remember when…” posts.